Following the success of the 2012 exhibition, Your Main Event is proud to present the second Parent & Child Exhibition, to be held at The Riverside Stadium, Middlesbrough (home of MFC) on Sunday 13th October 2013. Developed with Parents and Parents-to-be in mind, this exhibition is sure to be a fun and informative family day out. Come along and meet with the many wonderful organisations on your door step, who offer educational, fun, 'could-not-live-without' products and services for your growing family. Our exhibitors will range from; baby & children's clubs, classes and activities to educators, childcare, leisure facilities and retailers. 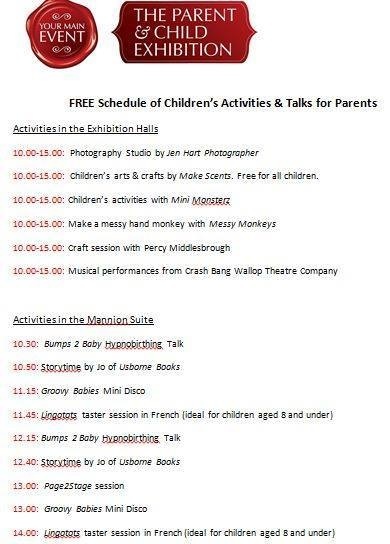 To ensure you all have a great day out, there will be various FREE children's activities taking place throughout the day.